You can't see screen shares. Use 'Join with video' for both audio and video. We do not apply charges for audio dial-in. But please keep in mind that your own carrier rates still apply. Your phone/mobile company will charge you as usual for minutes. To use dial in to join a call, dial the number listed on the join page, and follow the instructions spoken to you over the phone to enter your pin. At least one person must have joined the call over video before someone can dial-in. On the page to join your call, click Get more country numbers under the dial-in option. 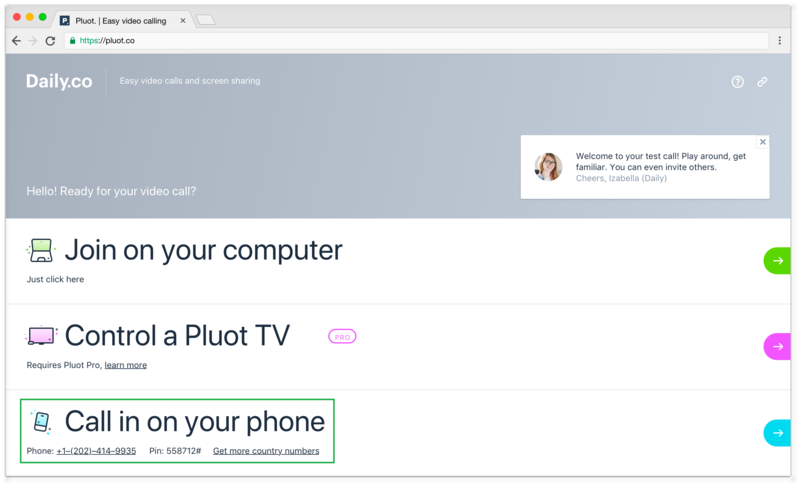 Your selection becomes your default dial-in number, for all calls. Don't see the country you need? Email help@daily.co or chat with us.